Durable, weather-resistant spare tire covers. Camco 45349 Vinyl Spare Tire Covers Arctic White - 21.5 In. 45342 Vinyl Spare Tire Covers Arctic White - 31.25 In. 45344 Vinyl Spare Tire Covers Arctic White - 29 In. 45345 Vinyl Spare Tire Covers Arctic White - 28 In. 45346 Vinyl Spare Tire Covers Arctic White - 27 In. 45352 Vinyl Spare Tire Covers Colonial White - 31.25 In. 45355 Vinyl Spare Tire Covers Colonial White - 28 In. 45356 Vinyl Spare Tire Covers Colonial White - 27 In. 45358 Vinyl Spare Tire Covers Colonial White - 24 In. Camco 45340 Vinyl Spare Tire Covers Arctic White - 34 In. 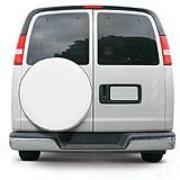 Camco 45342 Vinyl Spare Tire Covers Arctic White - 31.25 In. Camco 45344 Vinyl Spare Tire Covers Arctic White - 29 In. Camco 45345 Vinyl Spare Tire Covers Arctic White - 28 In. Camco 45346 Vinyl Spare Tire Covers Arctic White - 27 In.